Today I received a postcard from some friends in France. 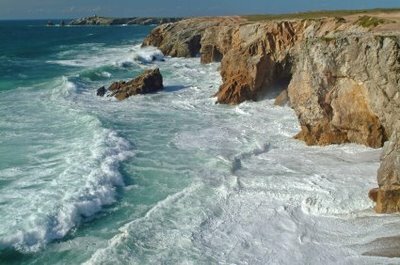 Nous voici à Quiberon pour 2 semaines de vacances, soleil radieux, ballades à vélo, baignades, pêche en mer, visites. Te souviens‐tu de Quiberon avec la marée noire en 2000 avec le bateau ERIKA? Tout est propre maintenant. La nature a repris ses droits. Nous pensons bien à toi. Here we are at Quiberon for 2 weeks on vacation: radiant sun, bicycle strolls, dips on the beach, fishing in the sea, tours. Do you remember Quiberon with the oil spill in 2000 from the ship ERIKA? Everything is clean now. Nature has reclaimed her rights. We are thinking well of you. How come I don’t write postcards like that?!!?!?!? I do indeed remember Quiberon in 2000. We ate ham and cheese on baguettes by the shore. There was debris and algae everywhere. Annie got some oil on her khakis from sitting on an unsuspecting rock. What a tragedy! Perhaps one day in the future I can write such a Philadelphia postcard to my dear visitors. That would be amazing. Coucou de Philadelphie! Il fait toujours soleil ici. Y’a tant d’hipsters en vélo et des gangsters sur véhicule tout‐terrain, partageant la rue en paix. La rivière Delaware est super pour nager et pour la pêche. Y’a tant d’activités. Rappelle‐toi de ta visite en 2012, t’as vu tous les déchets dans la rue et tant de nid‐de‐poules, aussi ils étaient tellement snob à la fondation Barnes? Tout est restauré maintenant. L’amour et la justice ont vaincu. Les enfants jouent dans la rue sans soucis et ils savent parler anglais sans erreur. Il n’y à plus de crotte de chien sur le trottoir et l’entrée à tous les musées est gratuite. Je pense à vous souvent. Hello from Philly! It’s always sunny here. There are so many hipsters on bikes and thugs on ATVs, peacefully sharing the road. The Delaware is great for swimming and fishing. There is so much to see and do! Do you remember your visit in 2012 when you saw all the trash and potholes, and the staff at the Barnes Foundation was really snobby? Everything is restored now. Love and Justice have prevailed. Children are safely playing in the streets and know how to speak proper English when necessary. There is no more dog [poop] on the sidewalks and all the museums are free. your post card totally has character! i don’t know what you are talkin’ about. my fav line.. ‘hipsters on bikes and thugs on ATVs’… lol, so true! i see the same thing in my ‘hood too.